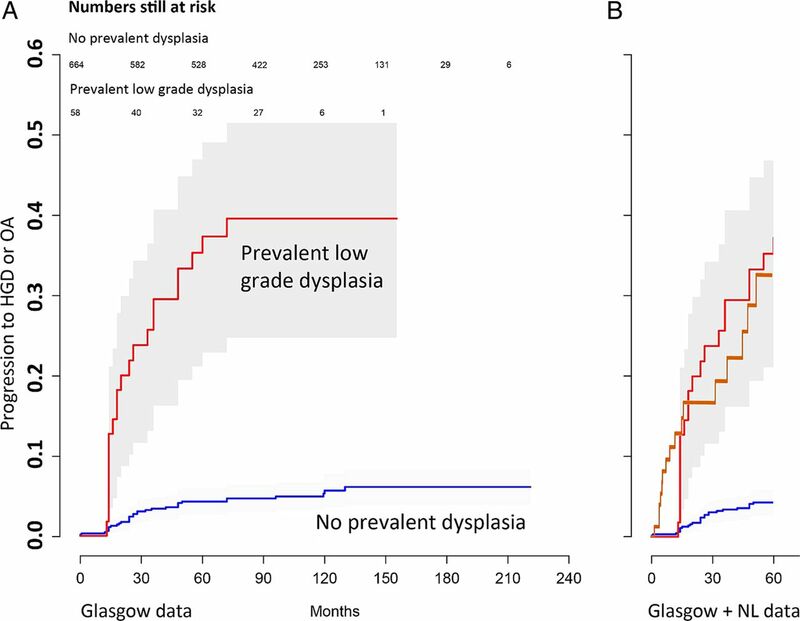 We read with interest the work by Duits et al 1 who find that validated low-grade dysplasia (LGD) is highly predictive of malignant progression in Barrett's oesophagus (BO). Yachimski2 stresses the need for this important finding to be validated in other centres. Our experience of prevalent LGD as a predictor of malignant progression in BO in the West of Scotland strongly reinforces the conclusions of our colleagues in the Netherlands. Patients with BO diagnosed between 1994 and 2009 at one centre (Glasgow Royal Infirmary (GRI)) all had BO visible endoscopically, with biopsy-proven metaplastic glandular mucosa in the tubular oesophagus. Exclusions for residence outside GRI catchment area, severe comorbidities, refusal of surveillance, loss to follow-up, high-grade dysplasia (HGD) or oesophageal adenocarcinoma (OA) at diagnosis (or ascertained within 1 year of index endoscopy), or being indefinite for dysplasia (n=15) left 145 short (≤3 cm) and 577 long (>3 cm) patients with BO in surveillance. Biopsy protocol was by endoscopist's choice. Endoscopy was biennial without LGD, and 3–6 monthly after LGD ascertainment. Patients with new HGD or OA were offered endoscopic treatment or surgery. Proton pump inhibitors (PPIs) were prescribed throughout. Death and its causes were ascertained from the regional registrar. Follow-up was from entry to progression, death or 31 December 2012. Age and BO length thresholds were taken as <65, 65–74, >75 years; ≤3 cm, >3 cm. Progression-free survival was examined with the Kaplan–Meier estimator and Cox’s proportional hazards regression of progression to HGD or OA with the following factors: prevalent dysplasia as originally reported, age, gender, segment length and social deprivation, using R V.3.0.2, with libraries survival and muhaz. Our 722-person cohort of 437 men (1st quartile:median:3rd quartile 53:63:72 years) and 285 women (61:69:78 years) underwent 74 989 months’ follow-up (75:109:137 months). N=58 patients with prevalent dysplasia were slightly older (median 67 vs 64 years, p<0.05) and more likely to be male (40 men, 18 women, p<0.02). Of these 58, 21 (36%) progressed to HGD (9) or OA (12) at overall rates of 2.0% and 2.7% per annum, respectively (p<0.001). Of the 664 patients without identified prevalent dysplasia, 85 progressed: 54 (8%) to LGD at 0.93% per annum. Only 10 (1.5%) developed HGD at 0.17% per annum and 21 (3.2%) OA, at 0.36% per annum. LGD was powerfully predictive of progression, with HR 10.8 (95% CI 5.9 to 18.1) for progression to HGD and 7.3 (95% CI 3.6 to 14.7) for progression to OA. No other factor was prognostic independent of LGD. Figure 1A shows malignant progression (to HGD/OA) stratified by prevalent LGD status. Comparison with figure 3 of Duits et al 1 shows an identical proportion of patients with LGD with malignant progression in our cohort and in the Dutch cohort (figure 1B). (A) Kaplan–Meier curves for malignant progression (to HGD and/or OA) in Glasgow BO cases with prevalent LGD (red curve) and without (blue). Grey shading represents 95% CI. Numbers in follow-up are given above the x axis. (B) duplicates the first 5 years of these curves and superimposes (in orange) the curve for malignant progression of LGD, validated by Duits et al 1 in the Netherlands. The LGD curves are very close at 5 years. BO, Barrett's oesophagus; HGD, high-grade dysplasia; LGD, low-grade dysplasia; NL, Netherlands; OA, oesophageal adenocarcinoma. Our patients with BO and prevalent LGD had a 10-fold hazard of progression to HGD and sevenfold to OA compared with those without dysplasia. Kaplan–Meier plots for progression to HGD/OA in our patients with LGD and those validated by Duits et al are almost identical: this is good evidence that what we call LGD in Glasgow and what our expert colleagues in Amsterdam and Nieuwegein call LGD are indeed the same. Our analysis is of histopathology reports as originally issued by reporting pathologist(s), but throughout the study period, specialist GI pathologists, AKF, JJG and KAO, were readily available to colleagues for discussion and case review. We are not special, and we think any motivated group of GI histopathologists should achieve risk stratification equally good or better. We strongly endorse present recommendations for peer review and audit of dysplasia diagnoses in BO.3 Radiofrequency ablation (RFA) prevents progression of LGD in BO,4 but it is not universally accepted that malignant progression occurs often enough in LGD to justify RFA. We think validated LGD (purged of spurious diagnoses) is a genuine marker of high progression risk in BO, which should be actively sought in new BO cases and when found, should be treated. The important role of consultant surgeon Mr Robert C Stuart in establishing Barrett's Oesophagus services at Glasgow Royal Infirmary is respectfully acknowledged. Contributors LHM, GMF and JJG designed the study. AKF, KAO and JJG were responsible for histopathology reporting. LHM collated the data. LHM and JJG analysed it. LHM and JJG drafted the manuscript with input from all authors. JJG had access to all data, and takes responsibility for its integrity and accuracy of data analysis. Competing interests GMF has received consultancy fees for Barrx/Covidien RFA meetings. Data sharing statement We would be content for interested parties to.